I briefly touched on NetApp HCI in my Tech Round Up 22nd June 2017. The NetApp HCI Visio’s are now available from http://www.visiocafe.com/netapp.htm. The physical representation of the minimum configuration is below. Note: Personally I disagree with Chris Mellor’s view. The storage and compute are all in one box, so it’s hyperconverged end of story (vBlock, Flexpod... get away with being converged by virtue of all components being in the same cabinet). IMHO, the NetApp HCI solution is much better than First Generation HCI solutions where you’d either end up with way too much storage, or way too much compute. If I was being really picky though, it might be nice to be able to add memory for VMs / cores for VMs separately (i.e. so don’t end up with either way too much CPU, or way too much memory), still, that’d make the solution less elegant and more complex. Rollason: "The HCI storage capabilities exactly match SF AFA scale. The ESX cluster sizes are only limited by ESX maximums. The management software for HCI can manage multiple storage and ESX clusters within the same solution and UI. That combines to allow HCI scale to be in theory limitless." Rollason: "In real life the thing that would limit the scale of the solution would be VMware vCenter’s maximum capabilities. NetApp HCI architecture has nothing that limits it from continuing to expand in a single solution so long as a vCenter Server can handle it." The VMware vSphere 6.0 Configuration Maximums lists a maximum of 1000 Hosts per vCenter Server. The VMware vSphere 6.5 Configuration Maximums lists a maximum of 2000 Hosts per vCenter Server. The NetApp HWU has SolidFire having 100 max nodes per cluster. A single NetApp HCI solution could scale up to 2000 compute nodes (with vSphere 6.5), and as many up-to 100 storage node clusters as the hosts could support. 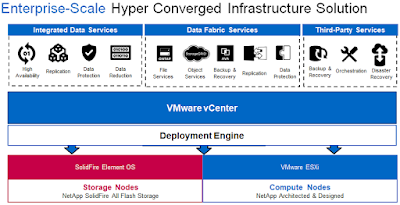 NetApp HCI: Enterprise-Scale Hyper Converged Infrastructure. Ready for Next. To Converge vs. Hyperconverge Infrastructure? 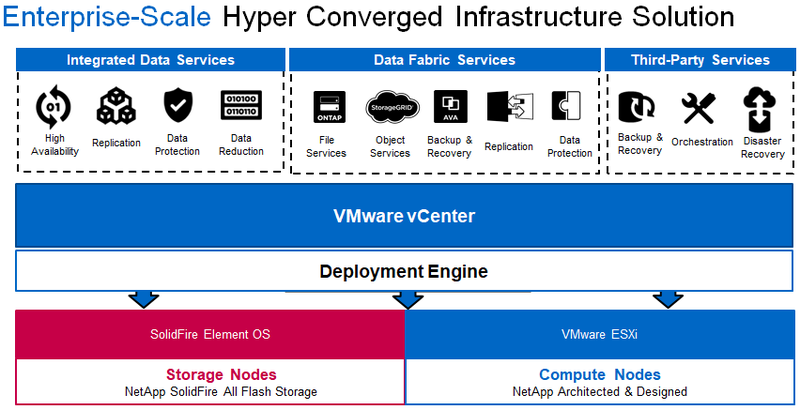 NetApp HCI is designed on the foundation of SolidFire and VMware ESXi - industry proven storage software and industry proven virtualization software. The only new element is the deployment engine. In practice, whilst SolidFire can technically scale to 100 nodes, I understand that SolidFire has only been tested up to 40 nodes (which is still way more than most companies will every need). There are production SolidFire clusters bigger than 40 nodes. At the time of writing this post, NetApp HCI hadn't been out long, so perhaps we will see some upper limits imposed in the future (the numbers will still be massive though).